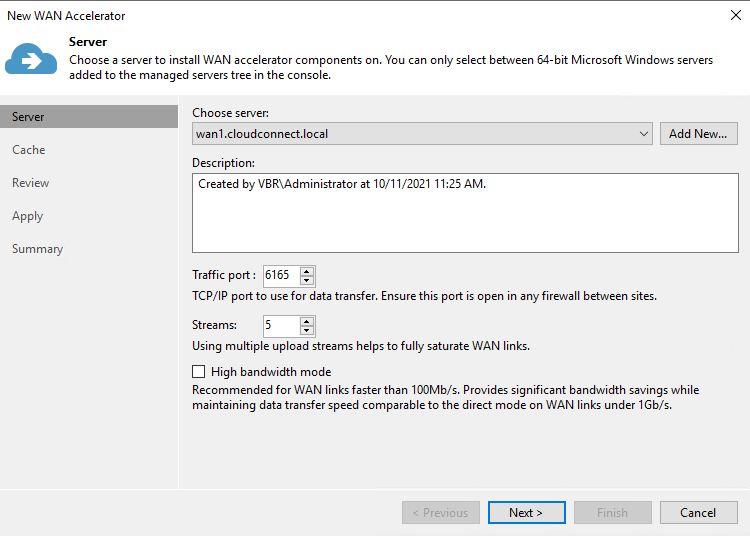 As explained previously, WAN accelerators are optional components, but any service provider should deploy them. Veeam Cloud Connect licensing enables the use of WAN accelerators at no additional cost for service providers, and most of all, their presence allow a service provider to offer a complete solution to those customers owning Veeam licenses with WAN acceleration enabled (Enterprise Plus, but also Enterprise if the target of a job is Cloud Connect). The 200 GB size for the cache disk is mainly a suggested starting point, used here as an example. One hundred gigabytes are assigned to the general cache, plus an additional 100 GB are allocated for each job cache requirements. Depending on the amount of customers assigned to a specific WAN accelerator and thus the total amount of managed data, the cache should be then increased to guarantee optimal performance to all customers connecting to a given WAN accelerator. 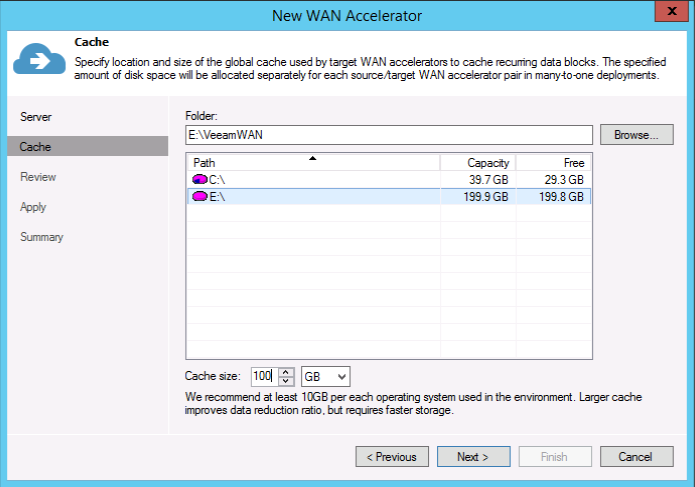 Please refer to Veeam User Guide and Best Practices to learn how to properly size the WAN accelerator cache. Finally, the use of multiple WAN accelerators is a good design solution in terms of High Availability (HA). Even if only one WAN accelerator can be assigned to a given customer, the presence of additional servers eventually allow to quickly reconfigure all customers linked to a failed WAN accelerator to use another one. Another common design choice is to dedicate one WAN accelerator to each customer requesting it. In this way, WAN accelerators can be spin up "on demand" only for those customers in need to use them, and can be offered as a premium option. Also, with this design a customer is not impacted by eventual problems happening at the WAN accelerator of anothe customer, since there&apos;s no sharing of WAN accelerators in this case. Both design are supported by Veeam Cloud Connect: in the case of shared accelerators, we recommend to not overload them. A maximum of 5 tenants linked to the same WAN accelerator is suggested. You can disable the last two rules and enable them only when a new Veeam component needs to be installed or upgraded because Veeam uses SMB shares to deploy the installer packages into remote Windows servers like WAN accelerators and Windows-based repositories. After the configuration of the two WAN accelerators is completed, they will be both listed in the corresponding section of Veeam Backup & Replication and be ready to use.